Hot chocolate cookies are the perfect way to eat the flavors of the classic holiday drink. 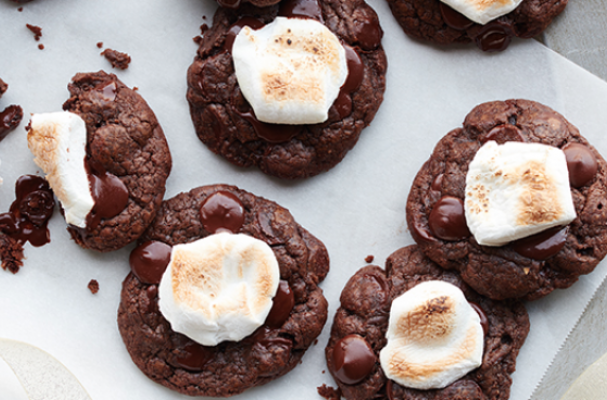 A chewy chocolate cookie dough is studded with dark chocolate chips and topped with a toasted marshmallow. Bittersweet chocolate really helps for the toasty notes and bold coffee flavors to shine while a marshmallow adds sweetness and softness. You can even add a sprinkling of crushed candy canes for a festive flair. Step 1: Melt the 3/4 cup chips gently in the microwave or over a pot of simmering water (bain marie). Set aside to cool. Step 2: Sift all of your dry ingredients together in a bowl and stir together. Step 3: Beat the butter and sugar together until thick and creamy. Step 4: Beat in your eggs one by one. Step 5: Add in your cooled melted chocolate and vanilla extract. Continue beating until your ingredients are well mixed. Step 6: Fold dry ingredients into the mix and the remaining chocolate chips and mix until combined. Step 7: Scoop your cookie with a 1 tablespoon scoop (if the mix is soft you can pop it in the fridge to stiffen up and this will make it easier to scoop). Step 8: Bake at 350°F for 8 - 9 minutes. Take care not to overbake as these cookies should be almost brownie-like. Step 9: Once baked, pop a marshmallow on top and put it back in the oven on broil for 1-2 minutes for a lovely toasted effect.